In 2015, IBA Group prepared the 2014 CSR report and submitted it for external audit. In 2017, IBA Group updated the CSR report to include the results for 2015 — 2016. The external audit was based on the following standards and criteria: United Nations Global Compact; ISO 26000; Global Reporting Initiative (GRI) and AA1000. The identified material aspects for this IBA Group’s CSR report are economic performance, market presence, indirect economic impact, energy, effluents and waste, products and services, overall, environmental grievance mechanisms, employment, occupation health and safety, training and education, labor practices grievance mechanisms, human rights grievance mechanisms, and product and service labeling. The CSR report covers the categories Social (sub-categories Society, Human Rights, and Product Responsibilities), Environmental, and Economic. This report contains Standard Disclosures from the GRI Sustainability Reporting Guidelines. The list of the Standard Disclosures shows the locations of disclosures in the IBA Group’s CSR report. The report was registered in the Sustainability Disclosure Database. 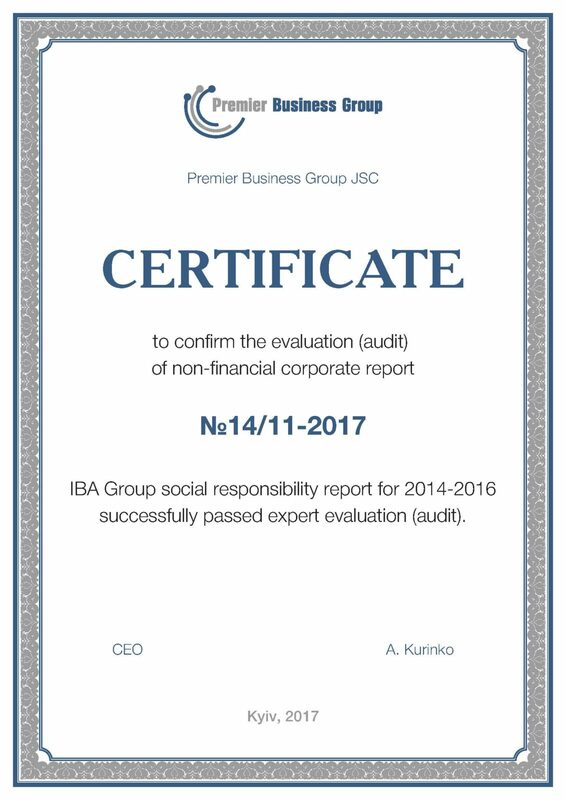 You can find the certificate confirming that IBA Group has successfully passed the evaluation by an independent authority. The IBA Group’s dedication to CSR allows for maintaining a high level of employee commitment, client loyalty, and confidence in the future.